The plays of Alfred Jarry are considered by many to be the first dramatic works of the theatre of the absurd. They are credited with a great number of literary innovations and are seen as major influences of the dada and symbolist movements in art. Ubu Roi (translated as King Ubu and King Turd) is Jarry’s most famous work. Ubu Roi eliminates the dramatic action from its Shakespearean antecedents and uses scatological humor and farce to present Jarry’s views on art, literature, politics, the ruling classes, and current events. 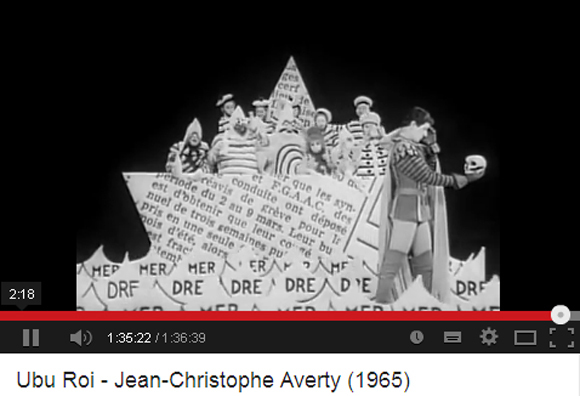 Ubu Roi first saw life as schoolboy farce, a parody of Felix Hebert, one of Jarry’s teachers. Co-authored with his friend, Henri Morin, the skit was transformed into a marionette play through several versions. In 1891, Jarry published a story, “Guignol,” reminiscent of the Punch and Judy performances popular throughout Europe, which showcased a vile and murderous Pere Ubu. A two-act version of Ubu Roi with songs for marionettes, Ubu sur la Batte, appeared in print in 1906. The opening night of December 11,1896, caused quite a stir according to Roger Shattuck in his work The Banquet Years. Actor Firmin Gernier stepped forward to speak the opening line — “Merdre!” (translated as “Shifter!”). The audience erupted in pandemonium. It took nearly fifteen minutes to silence the house and continue the play. Several people walked out without hearing any more. Fist fights broke out in the orchestra. Jarry supporters shouted, “You wouldn’t understand Shakespeare either!” Those who did not appreciate Jarry’s attack on theatrical realism replied with variations of le mot Ubu. In his book Jarry: Ubu Roi, Keith Beaumont detailed three accusations that were made against Ubu Roi by spectators and critics in the aftermath of the outrageous performance. The first focused on the play’s “alleged” vulgarity and obscenity. Secondly, perhaps in view of the political atmosphere of the time, critics condemned the play and its performance as the theatrical equivalent of an “anarchist” bomb attack and as an act of political subversion. The third accusation leveled against the play and its performance was that they in no way constituted a “serious” piece of literature or of theater but rather a gigantic hoax. This entry was posted on 31 July, 2014 in homepage and tagged Alfred Jarry, film, Jean-Christophe Averty, theatre of the absurd, Ubu Roi. Bookmark the permalink.